Sinks comes in different styles and sizes. They are also made from a wide variety of materials too. Stainless steel is one of the most popular kitchen sink materials because of a number of reasons. 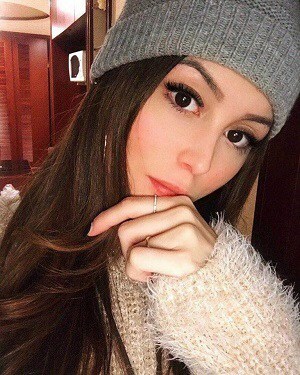 However, giving that there are so many good ones, finding the best might be difficult. We have reviewed 10 Stainless steel sinks on the market. This articles also includes a comprehensive guide that will help you make the best decisions. 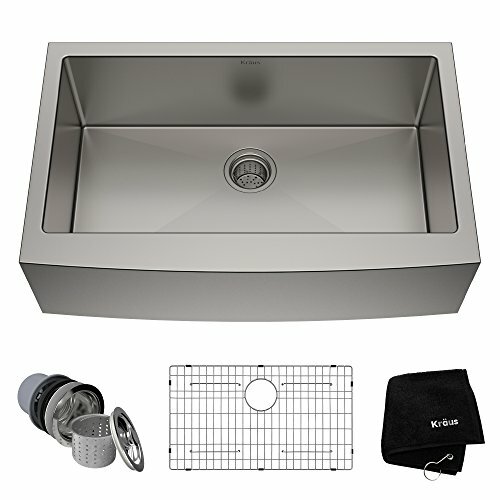 With the Kraus KHU100-30 Kitchen Sink what you get is a neat mix of elegance, stylish design with unique practicality. 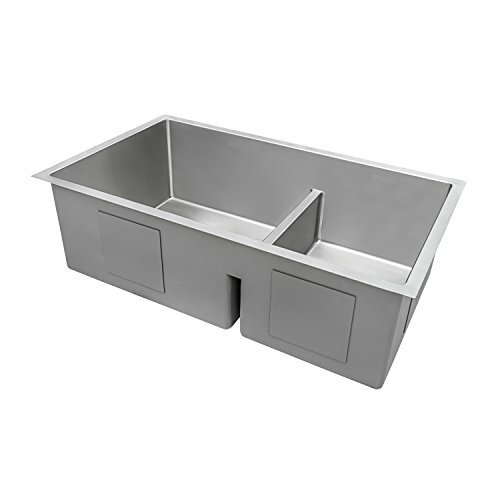 This top quality stainless steel sink comes with an oversized bowl large enough to easily accommodate your kitchenware. At the same time it doesn’t overwhelm you with cleaning. 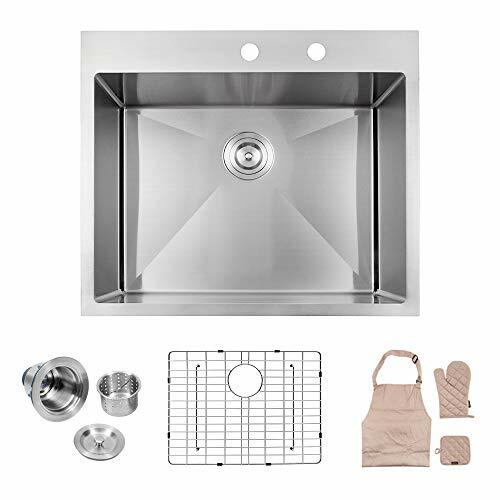 Everything with this sink has been designed to make it serve your needs for a long time to come which makes it one of the best stainless steel kitchen sinks around. It is built with extra-tough T30 stainless steel which has a reputation of being quite resistant to rust. Similarly, it features a TRU-16 construction which is also known to be dent resistant. All of these combined with its 1.5mm thickness means you will be landing yourself a highly durable sink. In addition to complementing your kitchen style, you also get a super quiet kitchen experience with this sink. First, it offers exceptional soundproofing tech which ensures that it doesn’t make hollow noises when you use. Also, the sink base comes with sound-absorbing pads which means even noise from the waste disposal or dishwasher is absorbed too. Its insulation, apart from preventing noise also works to prevent condensation as well. 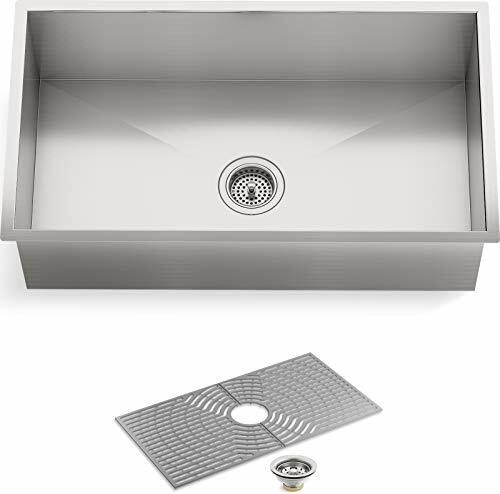 The Zuhne Modena 28-inch kitchen sink is made from premium quality 16 gauge stainless steel. This single bowl, undermount sink has a sturdy construction which works for both residential and commercial kitchen settings. In addition to its sturdy build, this sink also features an attractive, scratch-resistant finish that makes it a perfect match for your countertop. Owing to its thickness and other sound dampening features, this sink claims to be the quietest sink in the market. However, as evidenced by the positive reviews about it, that claim doesn't seem to be far-fetched after all. It features 5mm sound dampening pads which ensure noiseless operation of the sink at all times. Also, you are not short of space with this sink. Its 10-inch depth serves as sufficient enough space to conceal your dishes and prevent water splash to the barest minimum. Constructed with T-304 stainless steel and with a scratch resistant satin finish, this sink is an attractive addition to your countertop. Arguably one of the good stainless steel sinks, it is suitable for both residential and commercial grade use. This sink looks good in both modern and contemporary kitchens. It has a depth of 10 inches which is deep enough to fit in multiple kitchenware at the same time while leaving enough room for you to clean your dishes conveniently. You can trust this sink’s sturdy sink construction as a guarantee of durability. That is in addition to its premium quality finish that looks good on the eye and can resist scratching and reduce the chances of rusting for a long tome to come. This sink’s thick Rubber Dampening Pads work to insulate sound. Likewise, a stone Guard Undercoating further ensures the sink makes as little noise as possible during use. Ruvati has always been a top performer in kitchen sink construction. The company makes some of the great stainless steel sinks in the industry, This particularly smartly designed sink is another great quality kitchen you can trust for your home. 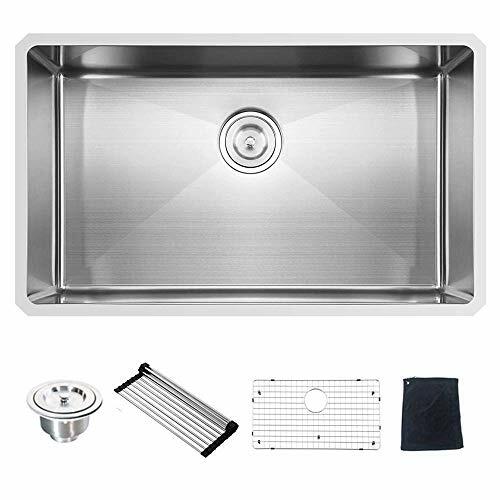 The 33-inch stainless steel sink features a low center divider. This divider is as much as 4 inches lower than what you will find in regular models. It provides extra clearance you will find important when dealing with large-sized pots or pans. Both the interior and the exterior of this sink has a brushed satin finished. There is also a 1 inch thick rim around the edges of the sink with a brushed finish as well. 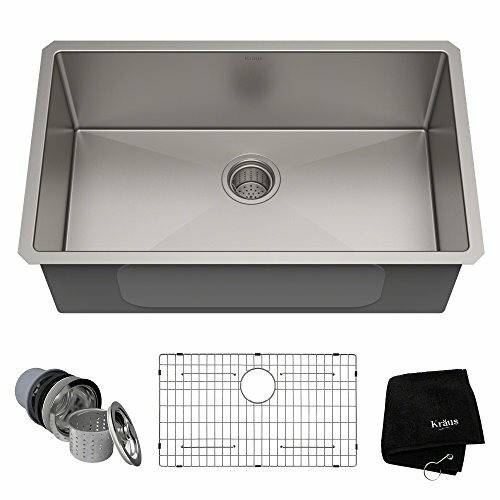 Furthermore, the sink is made from heavy-duty, T-304 grade stainless steel with a 16 gauge thickness. This makes it strong enough to withstand dings and dents. Additionally, its Nickel to chromium content also ensures that the sink is quite resistant to damage from rust. The sink features a 10mm tight radius corners. Although this is low compared to other models, it is curved enough to ensure easy cleaning, At the same time this design allows it to retain its square look. If what you are going for is a contemporary look for your kitchen, then the Kraus KHF200-33 sink is the one to go for. This top quality sink from Kraus has its bowls, specially handcrafted from premium quality 16 gauge T-304 stainless steel. On top of that, it is designed to be deep and wide. This makes it perfect for you especially if you deal with a lot of dishes, pots, and pans. A sleek look and an apron front design perfectly complements your kitchen countertop no matter your current kitchen style. But this sink has more than just good looks going for it. If you are a fan of quietly doing your work then it will totally work for you as well. Thanks to its top-level soundproofing technology, and an additional protective stone guard coating, your sink adequately dampens sound. This feature also keeps it protected against condensation as well.Also, the sink has a corrosion resistant surface thanks to its meticulous satin finish which making quite easy to maintain. For a feel of sophistication to your countertop,this 9-inch deep kitchen sink is a very good choice. Not only does it feature an elegant design which most homeowners will love, but it is also functional and durable too. Although this sink’s basin has a unique shape that is flatter than that of others, this provides optimum volume. Meaning you get more workspace for those who love to clean. You also get the luxury of doing the dishes without making too much noise thanks to its Sound deadening technology. It comes with SilentShield pads which helps to dampen vibrations from running water or even the garbage disposal unit. The sink’s Self-Trimming design is another feature you will like. The sink also comes with special accessories that are a perfect fit for the basin and are dishwasher safe. The sink and all its accessories are also quite easy to clean as well. If you are a fan of high-end stainless sinks with the neat contemporary design then this sink is just for you. Not just because it has the sleek look of a high-end model, but it also comes at a fraction of its cost too. An extra-tough T304 stainless steel build combined with a 1.5mm thick dent-resistant TRU16 construction is all the guarantee you need. From all indications, this sink will almost definitely stand the test of time. Furthermore, this impressive piece of engineering in addition to being quite sturdy also features a practical design. It is designed to be simple and quite convenient to use as well. Not only does has the angle of its base been optimized for stability, it makes easy drainage possible as well. Noise is another issue you don’t have to worry about. This sinks’ NoiseDefend technology helps to keep the sink soundproof at all time. What you will most likely love about this sink is that it comes with all the little accessories. This makes the sink quite desirable especially if you love to cook. You get a cutting board made from solid wood, stainless steel colander, and a roll-up rack for drying dishes. In addition to all of these, the sink comes with an overhanging lip which forms a track for sliding the accessories in. But we can also look away from the tiny nit bits, since almost all the best stainless steel kitchen sinks have them. The sink itself is solid 16 GAUGE thick sink. It has a top quality stainless steel build which is quite sturdy. Its brushed finish also makes it rust resistant and helps to hide scratches that are bound to occur with use. Noise and condensations are minimized by its thick rubber under-padding and heavy duty sound guard coating. 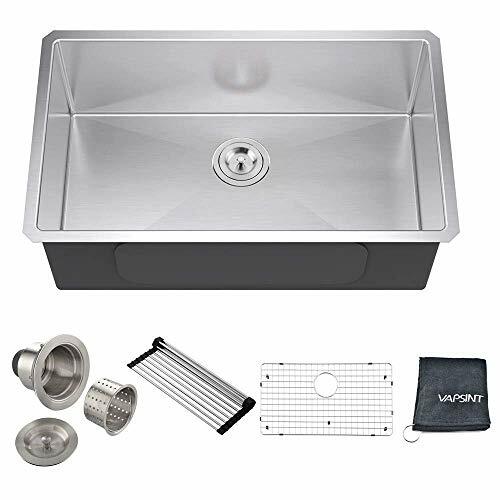 This 32-inch commercial kitchen sink from VAPSINT is another premium quality sink you can trust for durability, beauty, and ease of use. It is made from durable 18 gauge steel with a T-304 construction, giving it a sturdy look and guarantees durability. To complete the look it comes with scratch resistant top grade satin finish for added beauty and durability. 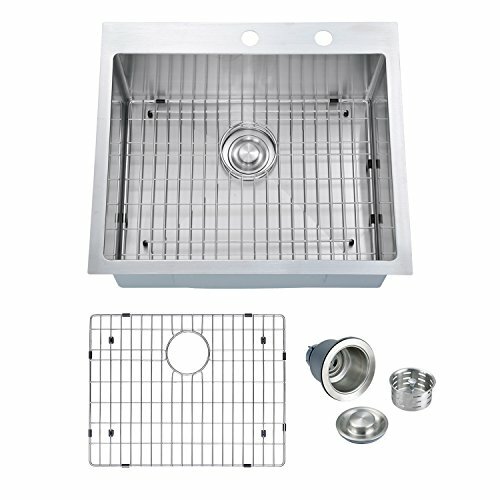 This kitchen sink is quite easy to install and maintain. 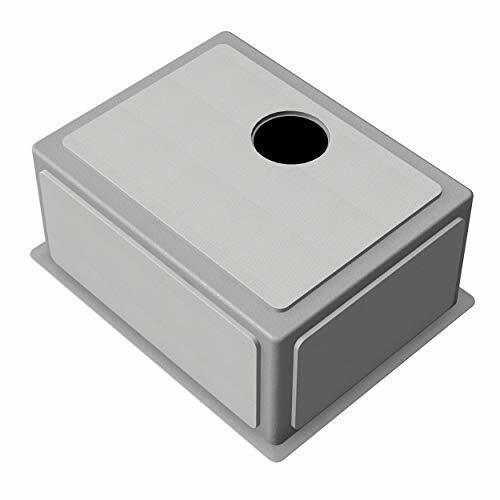 Its standard Standard 3-1/2" opening makes it a perfect fit for most drains and many of the common garbage disposal models out there. In terms of sound dampening technology, this sink comes well insulated with its 3mm thick dampening pads. There is also a stone guard undercoating which also prevents condensation from forming which can speed up damage. The PRIMART PHT2522S kitchen sink has been meticulously handcrafted with tough 16 gauge stainless steel for a guarantee of durability. Crafted to suit every style and type of kitchen, this countertop has delicately attractive features. Yet, it is designed to be strong and sturdy yet functional. A depth of 10 inches means it is deep enough to hold large sized pots and dish stacks of any size. This sink has also been crafted with careful detailing. Its has been designed with a tight 95-degree radius. That way you get maximum usable space without compromising on comfort while cleaning. This stainless steel sink also two faucet holes which further increases the functional utility of this sink all the more. You get a sink with non-porous brushed satin finish which is quite resistant to corrosion. There is also sufficient insulation and dampening pads to reduce noise with this sink. Stainless steel is one of the most popular choices when it comes to kitchen sinks. Most buyers prefer it because of how easy it is to maintain. Another obvious fact is that it looks good with almost every type of decor. However, even after settling the more important design issues like size, style and so on, it is still possible to run into issues when shopping for the best stainless steel kitchen sinks. Since there are different types and models out there, here are some important tips that can help you narrow down your options. Generally, the stainless steel sinks are the thick and sturdy ones that are at the same time noiseless. The gauge is a good way to figure this out. Counter-intuitively, when it comes to gauge the quality increases as the gauge decreases. This means a 22-gauge model will be less sturdy and more prone to vibration compared to a 16/18 gauge type. The low gauge sinks are thus more recommended. Depth is important especially if you will be stacking up a lot of dishes or working with large sized pots. A six inches basin, for example, will leave you wanting for more space and will most lastly even splash water. For optimum space, you want something in the 9 to 10 inches range. However, the style of the sink should also be put into consideration. This is because a 10-inch undermount sink will be a bit lower than its drop-in counterpart of the same depth. In terms of shape, the best stainless steel kitchen sinks have straight sides, square corners, and preferably a flat bottom. They also have low sloping angles at the base. This gives you sufficient workspace and are easier to clean and drain. Another subtle design factor to consider that can make all the difference is the position of the drain. Generally, you should consider sinks with sinks located a bit towards the back against the centered ones as they give you more space in the sink and are easier to drain too. It is normal for manufacturers to boast they have the most silent sink in town. This doesn’t automatically make them the best in town. One way to truly ascertain the veracity of this claim especially if you are shopping in person and not online is through the thump test. This implies simply tapping the sink and checking out how it sounds. A drum-like sound is a dead giveaway of how ineffective the undercoatings may be. Note however that with large stainless steel sinks, it is almost impossible to get that ninja-silent sink bowl manufacturers advertise. Thus the goal should be getting one with very minimal vibration. The best stainless steel sinks might not be silent but they are not loud either. Finally, you should consider the finish of your stainless steel sink as it determines its durability. Generally, a lustrous satin finish is considered by many experts as a better alternative compared to a matte finish. Also, the composition plays a role in durability as well and the expert opinion about this is an 18 to 8 chromium to nickel ratio. Finding the best stainless steel kitchen sink is not always easy because there are several good quality types. We have reviewed some of the best models in the market. Note that there are plenty of criteria you can use to pick the best on this list and its all about your preferences. If size is an important factor for you, then consider models like Ruvati 33-inch low-divide Kitchen Sink. 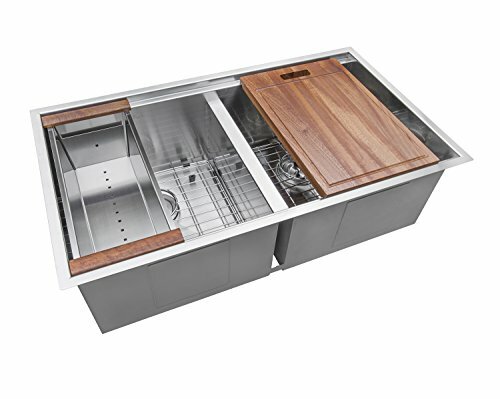 Alternatively, you could go for something portable yet functional like PRIMART PHT2522S Stainless Steel Drop-in Sink. At the end of the day, your preferences are the final deciding factor.